The following tables are intended for students of Oriental history who are able to use original authorities, to enable them readily to convert dates in the lunar years of the Muhammadan era of the Hijra into their corresponding dates in the Christian era. The first table contains three columns. The first column contains every year of the era of the Hijra from its beginning on July 16, A.D. 622, down CO the end of the twentieth century. The second column lives the years of the Christian era, leap years being marked with an asterisk, and the date in each year on which the corresponding year of the era of the Hijra began. The third gives the number of the days of each Christian year which had elapsed before the year of the Hijra began. The second table gives the months of the Christian year and the consecutive numbers of days of both common and leap years. The third gives the months of the year in the era of the Hijra and the consecutive numbers of days of the year. The method of using the tables can best be explained by examples. Let it be supposed that we wish to find the date in the Christian era corresponding to Rajab 10, A H. 722. The student first looks up the year 722 in the first column of Table I and finds that it began on January 20, A.D. 1322, nineteen days of the Christian year having elapsed before it began. He sets down the figures 19, and, turning to Table III, finds that Rajab 10 is the 187th day of the Hijra year. He then adds 187 to 19, obtaining the sum 206. Turning to Table II he finds that the 206th day of the Christian year, not being a leap year, is July 25. Therefore the Christian date corresponding to Rajab 10, A.H. 722, is July 25, 1322. But it often happens that a year of the Hijra goes far beyond the Christian year in which it began. Let us suppose, for instance, that we wish to find the date in the Christian era corresponding to Ramadan 5, A.H. 966. In Table I we find that the year 966 of the era of the Hijra began on October 14, 1558, when 286 days of the year had elapsed. Setting down the figures 286 we find, on reference to Table III, that Ramadan 5 is the 241st day of the lunar year. Adding 241 to 286 we get the sum 527, reckoned from January I, 1558. From this we subtract 365, the number of days in the Christian year 1558, and find that the remainder is 162. Ramadan 5, 966, is therefore the 162nd day of the Christian year following 1558, that is, as we discover from Table II, June 11, 1559. When a year of the era of the Hijra begins in a leap year of the Christian era and extends beyond that- year, it must be remembered that the number to be deducted from the sum of the days of the Christian year and those of the Hijra year, is 366, not 365: thus, if we wish to find the Christian date corresponding to Rajab 3, 1096, we find first that the year 1096 of the Hijra began on December 8, 1684, a leap year, of which 342 days had elapsed before the Hijra year began. Rajab 3, being the 180th day of the lunar year we add 180 to 342, obtaining the sum 522. The Christian year 1684 contained 366 days and we subtract 366 from 522, leaving the remainder 156. Thus, Rajab 3, 1096, corresponds to the 156th day of the Christian year 16lS5, that is, to June 5, 1685, as we discover from Table II. It must be remembered that the Muhammadan day, like the Biblical day, and the ecclesiastical day of the Christian Church, begins at sunset, so that what we call Thursday evening a Muslim will call Friday evening, and if a Muslim historian says that a certain event happened on the night of Safar 3, 1069 (October 31, 1658) it may have, happened between sunset and midnight on October 30, or between mid- night and dawn on October 31. One more word is necessary regarding the Old and New Styles of the Christian calendar. By 1582 it had been discovered that in the Julian calendar the length of the year had been slightly miscalculated, with the result that the days of the month were by then ten days in advance of the true dates. Pope Gregory XIII therefore reformed the Christian calendar and corrected the dates by omitting ten days from 1582, so that the Hijra year 991, which, had the Christian year not been altered, would have begun on January 15, began on January 25, 1583, according to the New, or Gregorian Style. Pope Gregory's reform of the calendar was gradually adopted by all countries in Europe, except England, Russia and Sweden. Russia, in her ecclesiastical calendar, still follows the Julian, or Old Style, but Britain reformed her calendar in 1752, by suppressing eleven days between September 2 and 14, so that the third day of that month in that year became the fourteenth. Pope Gregory's reform consisted besides the excision of ten days in 1582, in a change in the reckoning of leap years. In the Julian calendar every fourth year was a leap year, but in the Gregorian calendar century years are not leap years unless their first two figures are divisible by four. Thus 1600 was a leap year and 2000 will be a leap year, but 1700, 1800 and 1900 were not leap years. 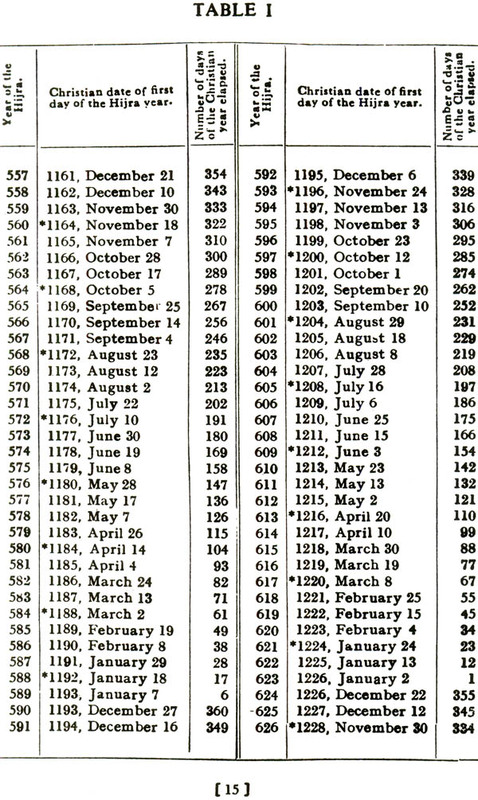 These tables follow the New Style from the date of its introduction by Pope Gregory in 1583. but should it be desired to express dates between that time and the year 1752, when the Gregorian calendar was adopted in England, ten days must be added to dates from 1583 to 1699 inclusive, and eleven days from that year to September 2, 1752.